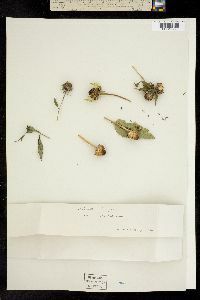 Perennials, 100-220 cm (rhizomatous). Stems erect, usually glabrous, sometimes proximally hirsute (glaucous). Leaves cauline; opposite (proximal) or alternate ; sessile or subsessile; blades (grayish green or bluish green) lanceolate, 8-15 × 1.5-3.5 cm, bases ± cuneate, margins serrate to subentire, abaxial faces glabrous or glabrate (smooth or slightly rough to touch, glaucous). Heads 1-6. Peduncles 2-8 cm. cm. Involucres cylindric, 10-15 mm diam. Phyllaries 23-28, lanceolate, 6-13 × 2-3 mm, (margins sometimes ciliate) apices acuminate, abaxial faces glabrous, not gland-dotted. Paleae 8.5-10 mm, 3-toothed to subentire. Ray florets 5-10; laminae 15-20 mm. Disc florets 35+; corollas 5.5-6.5 mm, lobes yellow; anthers dark, appendages dark. Cypselae 4-5.5 mm, glabrous; pappi of 2 aristate scales 3.2-4.1 mm plus 0-1 deltate scales 0.5-1.1 mm. 2n = 68. Flowering late summer-fall. Shale barrens; 300-900+ m; N.C., S.C., Va., W.Va.